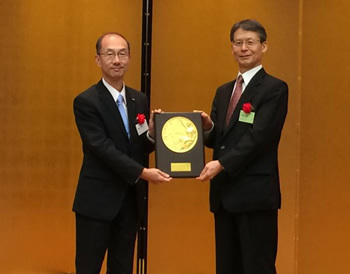 Tokyo, October 15, 2014 - Fuji Heavy Industries Ltd. (FHI), the manufacturer of Subaru automobiles, has been selected as the top company in the "automobile, auto parts and tires" category of the 2014 Awards for Excellence in Corporate Disclosure presented by the Securities Analysts Association of Japan (SAAJ). This is the first time FHI has received this award. The Excellence in Corporate Disclosure Awards have been presented by the SAAJ every year since 1995 with the goal of improving corporate information disclosure. This year marks the 20th year that the award program has been held. Companies are evaluated by securities analysts of each sector on the basis of the following five criteria: 1) management's stance on investor relations, the function of a corporation's investor relations department, and basic stance of a corporation's investor relations; 2) disclosures through briefings, interviews, and explanatory materials; 3) fairness in disclosure; 4) disclosure related to corporate governance; and 5) voluntary disclosure that conforms to conditions of each industry. FHI received high marks topping in four of the five criteria among the 20 companies in the "automobile, auto parts and tires" category that were evaluated. Under its management philosophy, FHI commits to becoming "a compelling company with a strong market presence" built on the "customer-first" principle. We will continue to meet our responsibilities as a company that conducts its business on the global stage and, in our IR activities, will seek to deepen shareholder and investor understanding of FHI through the broad-based and fair disclosure of corporate information.